With Available Options Like Lane Tracking Package (Blind Spot Assist and Lane Keeping Assist), Parking Assist Package (PARKTRONIC w/Active Parking Assist and Surround View System), Parking Package, Premium 1 Package (Android Auto, Apple CarPlay, DVD Drive, KEYLESS GO®, Multi-Color Ambient Lighting, Navigation Updates for 3 Years, Power Passenger Seat w/Memory & Lumbar, Radio: COMAND Navigation, SiriusXM Satellite Radio, and Smartphone Integration Package - Apply CarPlay, Android Auto), 19" 5-Spoke Wheels, 2nd Row Power EASY-ENTRY, 3.27 Axle Ratio, 3rd row seats: split-bench, 4-Way Driver Lumbar Support, 4-Wheel Disc Brakes, 8 Speakers, 8" Color Display Upgrade, 8-Way Power Front Seats, ABS brakes, Air Conditioning, AM/FM radio, AM/FM/CD Radio, Anthracite Poplar Wood Trim, Anti-whiplash front head restraints, Auto tilt-away steering wheel, Auto-dimming door mirrors, Auto-dimming Rear-View mirror, Auto-leveling suspension, Automatic temperature control, Black Headliner, Bodyside moldings, Brake assist, Bumpers: body-color, CD player, Child-Seat-Sensing Airbag, Compass, Delay-off headlights, Driver door bin, Driver vanity mirror, Dual front impact airbags, Dual front side impact airbags, DVD-Audio, Electronic Stability Control, Emergency communication system: Mercedes me connect, Eucalyptus Wood Trim, Exterior Parking Camera Rear, Four wheel independent suspension, Front anti-roll bar, Front Bucket Seats, Front Center Armrest w/Storage, Front dual zone A/C, Front reading lights, Fully automatic headlights, Garage door transmitter: Homelink, Genuine wood console insert, Genuine wood dashboard insert, Genuine wood door panel insert, harman/kardon® Logic 7® Surround Sound System, Heated & Cooled Front Cup Holders, Heated door mirrors, Heated Front Seats, Heated front seats, Heated Steering Wheel, Illuminated entry, Knee airbag, Leather steering wheel, Low tire pressure warning, MB-Tex Upholstery, Memory seat, Occupant sensing airbag, Outside temperature display, Overhead airbag, Overhead console, Panic alarm, Panorama Roof, Passenger door bin, Passenger vanity mirror, Power adjustable front head restraints, Power door mirrors, Power driver seat, Power Front Seats w/Driver Memory, Power Liftgate, Power moonroof, Power passenger seat, Power steering, Power windows, Premium audio system: COMAND, Rain sensing wipers, Rear anti-roll bar, Rear fog lights, Rear reading lights, Rear seat center armrest, Rear Seat Entertainment System Pre-Wiring, Rear window defroster, Rear window wiper, Remote keyless entry, Roof rack: rails only, Security system, Single CD Player, Speed control, Speed-sensing steering, Speed-Sensitive Wipers, Split folding rear seat, Spoiler, Steering wheel memory, Steering wheel mounted audio controls, Tachometer, Telescoping steering wheel, Tilt steering wheel, Traction control, Trailer Hitch, Trip computer, Turn signal indicator mirrors, Variably intermittent wipers, Weather band radio, and Wheels: 19" Twin 5-Spoke Vehicle may not have all options as described due to automated process. 2019 Mercedes-Benz GLS GLS 450 4MATIC® 4MATIC® V6 9-Speed Automatic Black Sunroof / Panorama Roof, NAVIGATION!, 3rd Row Seat, Backup Camera, Bluetooth, Hands-Free, AWD / 4WD, Heated Seats, Keyless Entry, Premium Sound, Premium Package, BLIND SPOT ASSIST, KEYLESS-GO. With Available Options Like Appearance Package (20" 10-Spoke Wheels and Illuminated Running Boards), Lane Tracking Package (Blind Spot Assist and Lane Keeping Assist), Lighting Package (Active LED Headlamps and Adaptive Highbeam Assist), Parking Assist Package (PARKTRONIC w/Active Parking Assist and Surround View System), Parking Package, Premium 1 Package (Android Auto, Apple CarPlay, DVD Drive, KEYLESS GO®, Multi-Color Ambient Lighting, Navigation Updates for 3 Years, Power Passenger Seat w/Memory & Lumbar, Radio: COMAND Navigation, SiriusXM Satellite Radio, and Smartphone Integration Package - Apply CarPlay, Android Auto), 19" 5-Spoke Wheels, 3.27 Axle Ratio, 3rd row seats: split-bench, 4-Way Driver Lumbar Support, 4-Wheel Disc Brakes, 8 Speakers, 8" Color Display Upgrade, 8-Way Power Front Seats, ABS brakes, Air Conditioning, AM/FM radio, AM/FM/CD Radio, Anti-whiplash front head restraints, Auto tilt-away steering wheel, Auto-dimming door mirrors, Auto-dimming Rear-View mirror, Auto-leveling suspension, Automatic temperature control, Bodyside moldings, Brake assist, Bumpers: body-color, CD player, Child-Seat-Sensing Airbag, Compass, Delay-off headlights, Driver door bin, Driver vanity mirror, Dual front impact airbags, Dual front side impact airbags, DVD-Audio, Electronic Stability Control, Emergency communication system: Mercedes me connect, Eucalyptus Wood Trim, Exterior Parking Camera Rear, Four wheel independent suspension, Front anti-roll bar, Front Bucket Seats, Front Center Armrest w/Storage, Front dual zone A/C, Front reading lights, Fully automatic headlights, Garage door transmitter: Homelink, Genuine wood console insert, Genuine wood dashboard insert, Genuine wood door panel insert, Heated door mirrors, Heated Front Seats, Heated front seats, Heated Steering Wheel, Illuminated entry, Knee airbag, Leather steering wheel, Low tire pressure warning, MB-Tex Upholstery, Memory seat, Occupant sensing airbag, Outside temperature display, Overhead airbag, Overhead console, Panic alarm, Panorama Roof, Passenger door bin, Passenger vanity mirror, Power adjustable front head restraints, Power door mirrors, Power driver seat, Power Front Seats w/Driver Memory, Power Liftgate, Power moonroof, Power passenger seat, Power steering, Power windows, Premium audio system: COMAND, Rain sensing wipers, Rear anti-roll bar, Rear fog lights, Rear reading lights, Rear seat center armrest, Rear window defroster, Rear window wiper, Remote keyless entry, Roof rack: rails only, Security system, Single CD Player, Speed control, Speed-sensing steering, Speed-Sensitive Wipers, Split folding rear seat, Spoiler, Steering wheel memory, Steering wheel mounted audio controls, Tachometer, Telescoping steering wheel, Tilt steering wheel, Traction control, Trailer Hitch, Trip computer, Turn signal indicator mirrors, Variably intermittent wipers, and Weather band radio Vehicle may not have all options as described due to automated process. With Available Options Like Appearance Package (20" 10-Spoke Wheels and Illuminated Running Boards), Lane Tracking Package (Blind Spot Assist and Lane Keeping Assist), Lighting Package (Active LED Headlamps and Adaptive Highbeam Assist), Parking Assist Package (PARKTRONIC w/Active Parking Assist and Surround View System), Parking Package, Premium 1 Package (Android Auto, Apple CarPlay, DVD Drive, KEYLESS GO®, Multi-Color Ambient Lighting, Navigation Updates for 3 Years, Power Passenger Seat w/Memory & Lumbar, Radio: COMAND Navigation, SiriusXM Satellite Radio, and Smartphone Integration Package - Apply CarPlay, Android Auto), 19" 5-Spoke Wheels, 2nd Row Power EASY-ENTRY, 3.27 Axle Ratio, 3rd row seats: split-bench, 4-Way Driver Lumbar Support, 4-Wheel Disc Brakes, 8 Speakers, 8" Color Display Upgrade, 8-Way Power Front Seats, ABS brakes, Air Conditioning, AM/FM radio, AM/FM/CD Radio, Anti-whiplash front head restraints, Auto tilt-away steering wheel, Auto-dimming door mirrors, Auto-dimming Rear-View mirror, Auto-leveling suspension, Automatic temperature control, Bodyside moldings, Brake assist, Bumpers: body-color, CD player, Child-Seat-Sensing Airbag, Compass, Delay-off headlights, Driver door bin, Driver vanity mirror, Dual front impact airbags, Dual front side impact airbags, DVD-Audio, Electronic Stability Control, Emergency communication system: Mercedes me connect, Eucalyptus Wood Trim, Exterior Parking Camera Rear, Four wheel independent suspension, Front anti-roll bar, Front Bucket Seats, Front Center Armrest w/Storage, Front dual zone A/C, Front reading lights, Fully automatic headlights, Garage door transmitter: Homelink, Genuine wood console insert, Genuine wood dashboard insert, Genuine wood door panel insert, harman/kardon® Logic 7® Surround Sound System, Heated & Cooled Front Cup Holders, Heated door mirrors, Heated Front Seats, Heated front seats, Heated Steering Wheel, Illuminated entry, Knee airbag, Leather steering wheel, Low tire pressure warning, MB-Tex Upholstery, Memory seat, Occupant sensing airbag, Outside temperature display, Overhead airbag, Overhead console, Panic alarm, Panorama Roof, Passenger door bin, Passenger vanity mirror, Porcelain Headliner, Power adjustable front head restraints, Power door mirrors, Power driver seat, Power Front Seats w/Driver Memory, Power Liftgate, Power moonroof, Power passenger seat, Power steering, Power windows, Premium audio system: COMAND, Rain sensing wipers, Rear anti-roll bar, Rear fog lights, Rear reading lights, Rear seat center armrest, Rear Seat Entertainment System Pre-Wiring, Rear window defroster, Rear window wiper, Remote keyless entry, Roof rack: rails only, Security system, Single CD Player, Speed control, Speed-sensing steering, Speed-Sensitive Wipers, Split folding rear seat, Spoiler, Steering wheel memory, Steering wheel mounted audio controls, Tachometer, Telescoping steering wheel, Tilt steering wheel, Traction control, Trailer Hitch, Trip computer, Turn signal indicator mirrors, Variably intermittent wipers, and Weather band radio Vehicle may not have all options as described due to automated process. With Available Options Like Appearance Package (20" 10-Spoke Wheels and Illuminated Running Boards), Lane Tracking Package (Blind Spot Assist and Lane Keeping Assist), Lighting Package (Active LED Headlamps and Adaptive Highbeam Assist), Parking Assist Package (PARKTRONIC w/Active Parking Assist and Surround View System), Parking Package, Premium 1 Package (Android Auto, Apple CarPlay, DVD Drive, KEYLESS GO®, Multi-Color Ambient Lighting, Navigation Updates for 3 Years, Power Passenger Seat w/Memory & Lumbar, Radio: COMAND Navigation, SiriusXM Satellite Radio, and Smartphone Integration Package - Apply CarPlay, Android Auto), 19" 5-Spoke Wheels, 2nd Row Power EASY-ENTRY, 3.27 Axle Ratio, 3rd row seats: split-bench, 4-Way Driver Lumbar Support, 4-Wheel Disc Brakes, 8 Speakers, 8" Color Display Upgrade, 8-Way Power Front Seats, ABS brakes, Air Conditioning, AM/FM radio, AM/FM/CD Radio, Anti-whiplash front head restraints, Auto tilt-away steering wheel, Auto-dimming door mirrors, Auto-dimming Rear-View mirror, Auto-leveling suspension, Automatic temperature control, Bodyside moldings, Brake assist, Bumpers: body-color, CD player, Child-Seat-Sensing Airbag, Compass, Delay-off headlights, Driver door bin, Driver vanity mirror, Dual front impact airbags, Dual front side impact airbags, DVD-Audio, Electronic Stability Control, Emergency communication system: Mercedes me connect, Eucalyptus Wood Trim, Exterior Parking Camera Rear, Four wheel independent suspension, Front anti-roll bar, Front Bucket Seats, Front Center Armrest w/Storage, Front dual zone A/C, Front reading lights, Fully automatic headlights, Garage door transmitter: Homelink, Genuine wood console insert, Genuine wood dashboard insert, Genuine wood door panel insert, harman/kardon® Logic 7® Surround Sound System, Heated & Cooled Front Cup Holders, Heated door mirrors, Heated Front Seats, Heated front seats, Heated Steering Wheel, Illuminated entry, Illuminated Star, Knee airbag, Leather steering wheel, Low tire pressure warning, MB-Tex Upholstery, Memory seat, Occupant sensing airbag, Outside temperature display, Overhead airbag, Overhead console, Panic alarm, Panorama Roof, Passenger door bin, Passenger vanity mirror, Porcelain Headliner, Power adjustable front head restraints, Power door mirrors, Power driver seat, Power Front Seats w/Driver Memory, Power Liftgate, Power moonroof, Power passenger seat, Power steering, Power windows, Premium audio system: COMAND, Rain sensing wipers, Rear anti-roll bar, Rear fog lights, Rear reading lights, Rear seat center armrest, Rear Seat Entertainment System Pre-Wiring, Rear window defroster, Rear window wiper, Remote keyless entry, Roof rack: rails only, Security system, Single CD Player, Speed control, Speed-sensing steering, Speed-Sensitive Wipers, Split folding rear seat, Spoiler, Steering wheel memory, Steering wheel mounted audio controls, Tachometer, Telescoping steering wheel, Tilt steering wheel, Traction control, Trailer Hitch, Trip computer, Turn signal indicator mirrors, Variably intermittent wipers, Weather band radio, and Wheel Locking Bolts Vehicle may not have all options as described due to automated process. 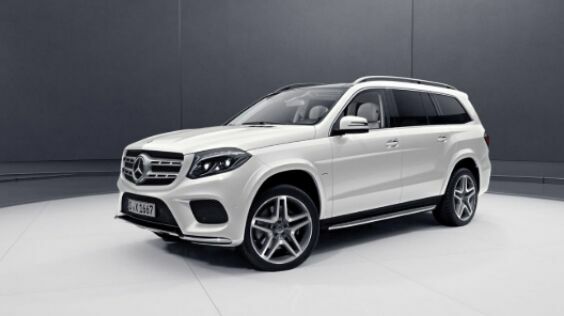 2019 Mercedes-Benz GLS GLS 450 4MATIC® 4MATIC® V6 9-Speed Automatic Black Sunroof / Panorama Roof, NAVIGATION!, 3rd Row Seat, Backup Camera, Bluetooth, Hands-Free, AWD / 4WD, Heated Seats, Keyless Entry, Leather Seats, Premium Wheels, Premium Sound, Premium Package, BLIND SPOT ASSIST, KEYLESS-GO, Navigation System. With Available Options Like Appearance Package (20" 10-Spoke Wheels and Illuminated Running Boards), Lane Tracking Package (Blind Spot Assist and Lane Keeping Assist), Lighting Package (Active LED Headlamps and Adaptive Highbeam Assist), Parking Assist Package (PARKTRONIC w/Active Parking Assist and Surround View System), Parking Package, Premium 1 Package (Android Auto, Apple CarPlay, DVD Drive, KEYLESS GO®, Multi-Color Ambient Lighting, Navigation Updates for 3 Years, Power Passenger Seat w/Memory & Lumbar, Radio: COMAND Navigation, SiriusXM Satellite Radio, and Smartphone Integration Package - Apply CarPlay, Android Auto), Navigation System, 19" 5-Spoke Wheels, 2nd Row Power EASY-ENTRY, 3.27 Axle Ratio, 3rd row seats: split-bench, 4-Way Driver Lumbar Support, 4-Wheel Disc Brakes, 8 Speakers, 8" Color Display Upgrade, 8-Way Power Front Seats, ABS brakes, Air Conditioning, AM/FM radio, AM/FM/CD Radio, Anti-whiplash front head restraints, Auto tilt-away steering wheel, Auto-dimming door mirrors, Auto-dimming Rear-View mirror, Auto-leveling suspension, Automatic temperature control, Black Headliner, Bodyside moldings, Brake assist, Bumpers: body-color, CD player, Child-Seat-Sensing Airbag, Chrome Door Handle Inserts, Compass, Delay-off headlights, Driver door bin, Driver vanity mirror, Dual front impact airbags, Dual front side impact airbags, DVD-Audio, Electronic Stability Control, Emergency communication system: Mercedes me connect, Eucalyptus Wood Trim, Exterior Parking Camera Rear, Four wheel independent suspension, Front anti-roll bar, Front Bucket Seats, Front Center Armrest w/Storage, Front dual zone A/C, Front reading lights, Fully automatic headlights, Garage door transmitter: Homelink, Genuine wood console insert, Genuine wood dashboard insert, Genuine wood door panel insert, harman/kardon® Logic 7® Surround Sound System, Heated & Cooled Front Cup Holders, Heated door mirrors, Heated Front Seats, Heated front seats, Heated Steering Wheel, Illuminated entry, Illuminated Star, Knee airbag, Leather steering wheel, Low tire pressure warning, MB-Tex Upholstery, Memory seat, Occupant sensing airbag, Outside temperature display, Overhead airbag, Overhead console, Panic alarm, Panorama Roof, Passenger door bin, Passenger vanity mirror, Power adjustable front head restraints, Power door mirrors, Power driver seat, Power Front Seats w/Driver Memory, Power Liftgate, Power moonroof, Power passenger seat, Power steering, Power windows, Premium audio system: COMAND, Rain sensing wipers, Rear anti-roll bar, Rear fog lights, Rear reading lights, Rear seat center armrest, Rear window defroster, Rear window wiper, Remote keyless entry, Roof rack: rails only, Security system, Single CD Player, Speed control, Speed-sensing steering, Speed-Sensitive Wipers, Split folding rear seat, Spoiler, Steering wheel memory, Steering wheel mounted audio controls, Tachometer, Telescoping steering wheel, Tilt steering wheel, Traction control, Trailer Hitch, Trip computer, Turn signal indicator mirrors, Variably intermittent wipers, Weather band radio, and Wheel Locking Bolts Vehicle may not have all options as described due to automated process. With Available Options Like Appearance Package (20" 10-Spoke Wheels and Illuminated Running Boards), Lane Tracking Package (Blind Spot Assist and Lane Keeping Assist), Lighting Package (Active LED Headlamps and Adaptive Highbeam Assist), Parking Assist Package (PARKTRONIC w/Active Parking Assist and Surround View System), Parking Package, Premium 1 Package (Android Auto, Apple CarPlay, DVD Drive, KEYLESS GO®, Multi-Color Ambient Lighting, Navigation Updates for 3 Years, Power Passenger Seat w/Memory & Lumbar, Radio: COMAND Navigation, SiriusXM Satellite Radio, and Smartphone Integration Package - Apply CarPlay, Android Auto), 19" 5-Spoke Wheels, 2nd Row Power EASY-ENTRY, 3.27 Axle Ratio, 3rd row seats: split-bench, 4-Way Driver Lumbar Support, 4-Wheel Disc Brakes, 8 Speakers, 8" Color Display Upgrade, 8-Way Power Front Seats, ABS brakes, Air Conditioning, AM/FM radio, AM/FM/CD Radio, Anti-whiplash front head restraints, Auto tilt-away steering wheel, Auto-dimming door mirrors, Auto-dimming Rear-View mirror, Auto-leveling suspension, Automatic temperature control, Black Headliner, Bodyside moldings, Brake assist, Bumpers: body-color, CD player, Child-Seat-Sensing Airbag, Compass, Delay-off headlights, Driver door bin, Driver vanity mirror, Dual front impact airbags, Dual front side impact airbags, DVD-Audio, Electronic Stability Control, Emergency communication system: Mercedes me connect, Eucalyptus Wood Trim, Exterior Parking Camera Rear, Four wheel independent suspension, Front anti-roll bar, Front Bucket Seats, Front Center Armrest w/Storage, Front dual zone A/C, Front reading lights, Fully automatic headlights, Garage door transmitter: Homelink, Genuine wood console insert, Genuine wood dashboard insert, Genuine wood door panel insert, harman/kardon® Logic 7® Surround Sound System, Heated & Cooled Front Cup Holders, Heated door mirrors, Heated Front Seats, Heated front seats, Heated Steering Wheel, Illuminated entry, Illuminated Star, Knee airbag, Leather steering wheel, Low tire pressure warning, MB-Tex Upholstery, Memory seat, Occupant sensing airbag, Outside temperature display, Overhead airbag, Overhead console, Panic alarm, Panorama Roof, Passenger door bin, Passenger vanity mirror, Power adjustable front head restraints, Power door mirrors, Power driver seat, Power Front Seats w/Driver Memory, Power Liftgate, Power moonroof, Power passenger seat, Power steering, Power windows, Premium audio system: COMAND, Rain sensing wipers, Rear anti-roll bar, Rear fog lights, Rear reading lights, Rear seat center armrest, Rear Seat Entertainment System Pre-Wiring, Rear window defroster, Rear window wiper, Remote keyless entry, Roof rack: rails only, Security system, Single CD Player, Speed control, Speed-sensing steering, Speed-Sensitive Wipers, Split folding rear seat, Spoiler, Steering wheel memory, Steering wheel mounted audio controls, Tachometer, Telescoping steering wheel, Tilt steering wheel, Traction control, Trailer Hitch, Trip computer, Turn signal indicator mirrors, Variably intermittent wipers, Weather band radio, and Wheel Locking Bolts Vehicle may not have all options as described due to automated process. With Available Options Like Appearance Package (20" 10-Spoke Wheels and Illuminated Running Boards), Lane Tracking Package (Blind Spot Assist and Lane Keeping Assist), Lighting Package (Active LED Headlamps and Adaptive Highbeam Assist), Parking Assist Package (PARKTRONIC w/Active Parking Assist and Surround View System), Parking Package, Premium 1 Package (Android Auto, Apple CarPlay, DVD Drive, KEYLESS GO®, Multi-Color Ambient Lighting, Navigation Updates for 3 Years, Power Passenger Seat w/Memory & Lumbar, Radio: COMAND Navigation, SiriusXM Satellite Radio, and Smartphone Integration Package - Apply CarPlay, Android Auto), 19" 5-Spoke Wheels, 2nd Row Power EASY-ENTRY, 3.27 Axle Ratio, 3rd row seats: split-bench, 4-Way Driver Lumbar Support, 4-Wheel Disc Brakes, 8 Speakers, 8" Color Display Upgrade, 8-Way Power Front Seats, ABS brakes, Air Conditioning, AM/FM radio, AM/FM/CD Radio, Anti-whiplash front head restraints, Auto tilt-away steering wheel, Auto-dimming door mirrors, Auto-dimming Rear-View mirror, Auto-leveling suspension, Automatic temperature control, Bodyside moldings, Brake assist, Bumpers: body-color, CD player, Child-Seat-Sensing Airbag, Chrome Hood Fin Covers, Compass, Delay-off headlights, Driver door bin, Driver vanity mirror, Dual front impact airbags, Dual front side impact airbags, DVD-Audio, Electronic Stability Control, Emergency communication system: Mercedes me connect, Eucalyptus Wood Trim, Exterior Parking Camera Rear, Four wheel independent suspension, Front anti-roll bar, Front Bucket Seats, Front Center Armrest w/Storage, Front dual zone A/C, Front reading lights, Fully automatic headlights, Garage door transmitter: Homelink, Genuine wood console insert, Genuine wood dashboard insert, Genuine wood door panel insert, harman/kardon® Logic 7® Surround Sound System, Heated & Cooled Front Cup Holders, Heated door mirrors, Heated Front Seats, Heated front seats, Heated Steering Wheel, Illuminated entry, Illuminated Star, Knee airbag, Leather steering wheel, Low tire pressure warning, MB-Tex Upholstery, Memory seat, Occupant sensing airbag, Outside temperature display, Overhead airbag, Overhead console, Panic alarm, Panorama Roof, Passenger door bin, Passenger vanity mirror, Porcelain Headliner, Power adjustable front head restraints, Power door mirrors, Power driver seat, Power Front Seats w/Driver Memory, Power Liftgate, Power moonroof, Power passenger seat, Power steering, Power windows, Premium audio system: COMAND, Rain sensing wipers, Rear anti-roll bar, Rear fog lights, Rear reading lights, Rear seat center armrest, Rear Seat Entertainment System Pre-Wiring, Rear window defroster, Rear window wiper, Remote keyless entry, Roof rack: rails only, Security system, Single CD Player, Speed control, Speed-sensing steering, Speed-Sensitive Wipers, Split folding rear seat, Spoiler, Steering wheel memory, Steering wheel mounted audio controls, Tachometer, Telescoping steering wheel, Tilt steering wheel, Traction control, Trailer Hitch, Trip computer, Turn signal indicator mirrors, Variably intermittent wipers, Weather band radio, and Wheel Locking Bolts Vehicle may not have all options as described due to automated process. With Available Options Like Appearance Package (20" 10-Spoke Wheels and Illuminated Running Boards), Lane Tracking Package (Blind Spot Assist and Lane Keeping Assist), Lighting Package (Active LED Headlamps and Adaptive Highbeam Assist), Parking Assist Package (PARKTRONIC w/Active Parking Assist and Surround View System), Parking Package, Premium 1 Package (Android Auto, Apple CarPlay, DVD Drive, KEYLESS GO®, Multi-Color Ambient Lighting, Navigation Updates for 3 Years, Power Passenger Seat w/Memory & Lumbar, Radio: COMAND Navigation, SiriusXM Satellite Radio, and Smartphone Integration Package - Apply CarPlay, Android Auto), 19" 5-Spoke Wheels, 3.27 Axle Ratio, 3rd row seats: split-bench, 4-Way Driver Lumbar Support, 4-Wheel Disc Brakes, 8 Speakers, 8" Color Display Upgrade, 8-Way Power Front Seats, ABS brakes, Air Conditioning, AM/FM radio, AM/FM/CD Radio, Anti-whiplash front head restraints, Auto tilt-away steering wheel, Auto-dimming door mirrors, Auto-dimming Rear-View mirror, Auto-leveling suspension, Automatic temperature control, Bodyside moldings, Brake assist, Bumpers: body-color, CD player, Child-Seat-Sensing Airbag, Chrome Hood Fin Covers, Compass, Delay-off headlights, Driver door bin, Driver vanity mirror, Dual front impact airbags, Dual front side impact airbags, DVD-Audio, Electronic Stability Control, Emergency communication system: Mercedes me connect, Eucalyptus Wood Trim, Exterior Parking Camera Rear, Four wheel independent suspension, Front anti-roll bar, Front Bucket Seats, Front Center Armrest w/Storage, Front dual zone A/C, Front reading lights, Fully automatic headlights, Garage door transmitter: Homelink, Genuine wood console insert, Genuine wood dashboard insert, Genuine wood door panel insert, Heated & Cooled Front Cup Holders, Heated door mirrors, Heated Front Seats, Heated front seats, Heated Steering Wheel, Illuminated entry, Illuminated Star, Knee airbag, Leather steering wheel, Low tire pressure warning, MB-Tex Upholstery, Memory seat, Occupant sensing airbag, Outside temperature display, Overhead airbag, Overhead console, Panic alarm, Panorama Roof, Passenger door bin, Passenger vanity mirror, Porcelain Headliner, Power adjustable front head restraints, Power door mirrors, Power driver seat, Power Front Seats w/Driver Memory, Power Liftgate, Power moonroof, Power passenger seat, Power steering, Power windows, Premium audio system: COMAND, Rain sensing wipers, Rear anti-roll bar, Rear fog lights, Rear reading lights, Rear seat center armrest, Rear Seat Entertainment System Pre-Wiring, Rear window defroster, Rear window wiper, Remote keyless entry, Roof rack: rails only, Security system, Single CD Player, Speed control, Speed-sensing steering, Speed-Sensitive Wipers, Split folding rear seat, Spoiler, Steering wheel memory, Steering wheel mounted audio controls, Tachometer, Telescoping steering wheel, Tilt steering wheel, Traction control, Trailer Hitch, Trip computer, Turn signal indicator mirrors, Variably intermittent wipers, Weather band radio, and Wheel Locking Bolts Vehicle may not have all options as described due to automated process. With Available Options Like Appearance Package (20" 10-Spoke Wheels and Illuminated Running Boards), Lane Tracking Package (Blind Spot Assist and Lane Keeping Assist), Lighting Package (Active LED Headlamps and Adaptive Highbeam Assist), Parking Assist Package (PARKTRONIC w/Active Parking Assist and Surround View System), Parking Package, Premium 1 Package (Android Auto, Apple CarPlay, DVD Drive, KEYLESS GO®, Multi-Color Ambient Lighting, Navigation Updates for 3 Years, Power Passenger Seat w/Memory & Lumbar, Radio: COMAND Navigation, SiriusXM Satellite Radio, and Smartphone Integration Package - Apply CarPlay, Android Auto), 19" 5-Spoke Wheels, 2nd Row Power EASY-ENTRY, 3.27 Axle Ratio, 3rd row seats: split-bench, 4-Way Driver Lumbar Support, 4-Wheel Disc Brakes, 8 Speakers, 8" Color Display Upgrade, 8-Way Power Front Seats, ABS brakes, Air Conditioning, AM/FM radio, AM/FM/CD Radio, Anti-whiplash front head restraints, Auto tilt-away steering wheel, Auto-dimming door mirrors, Auto-dimming Rear-View mirror, Auto-leveling suspension, Automatic temperature control, Bodyside moldings, Brake assist, Bumpers: body-color, CD player, Child-Seat-Sensing Airbag, Compass, Delay-off headlights, Driver door bin, Driver vanity mirror, Dual front impact airbags, Dual front side impact airbags, DVD-Audio, Electronic Stability Control, Emergency communication system: Mercedes me connect, Eucalyptus Wood Trim, Exterior Parking Camera Rear, Four wheel independent suspension, Front anti-roll bar, Front Bucket Seats, Front Center Armrest w/Storage, Front dual zone A/C, Front reading lights, Fully automatic headlights, Garage door transmitter: Homelink, Genuine wood console insert, Genuine wood dashboard insert, Genuine wood door panel insert, harman/kardon® Logic 7® Surround Sound System, Heated & Cooled Front Cup Holders, Heated door mirrors, Heated Front Seats, Heated front seats, Heated Steering Wheel, Illuminated entry, Illuminated Star, Knee airbag, Leather steering wheel, Low tire pressure warning, MB-Tex Upholstery, Memory seat, Occupant sensing airbag, Outside temperature display, Overhead airbag, Overhead console, Panic alarm, Panorama Roof, Passenger door bin, Passenger vanity mirror, Power adjustable front head restraints, Power door mirrors, Power driver seat, Power Front Seats w/Driver Memory, Power Liftgate, Power moonroof, Power passenger seat, Power steering, Power windows, Premium audio system: COMAND, Rain sensing wipers, Rear anti-roll bar, Rear fog lights, Rear reading lights, Rear seat center armrest, Rear Seat Entertainment System Pre-Wiring, Rear window defroster, Rear window wiper, Remote keyless entry, Roof rack: rails only, Security system, Single CD Player, Speed control, Speed-sensing steering, Speed-Sensitive Wipers, Split folding rear seat, Spoiler, Steering wheel memory, Steering wheel mounted audio controls, Tachometer, Telescoping steering wheel, Tilt steering wheel, Traction control, Trailer Hitch, Trip computer, Turn signal indicator mirrors, Variably intermittent wipers, Weather band radio, and Wheel Locking Bolts Vehicle may not have all options as described due to automated process. With Available Options Like Appearance Package (20" 10-Spoke Wheels and Illuminated Running Boards), Lane Tracking Package (Blind Spot Assist and Lane Keeping Assist), Lighting Package (Active LED Headlamps and Adaptive Highbeam Assist), Parking Assist Package (PARKTRONIC w/Active Parking Assist and Surround View System), Parking Package, Premium 1 Package (Android Auto, Apple CarPlay, DVD Drive, KEYLESS GO®, Multi-Color Ambient Lighting, Navigation Updates for 3 Years, Power Passenger Seat w/Memory & Lumbar, Radio: COMAND Navigation, SiriusXM Satellite Radio, and Smartphone Integration Package - Apply CarPlay, Android Auto), 19" 5-Spoke Wheels, 2nd Row Power EASY-ENTRY, 3.27 Axle Ratio, 3rd row seats: split-bench, 4-Way Driver Lumbar Support, 4-Wheel Disc Brakes, 8 Speakers, 8" Color Display Upgrade, 8-Way Power Front Seats, ABS brakes, Air Conditioning, AM/FM radio, AM/FM/CD Radio, Anthracite Poplar Wood Trim, Anti-whiplash front head restraints, Auto tilt-away steering wheel, Auto-dimming door mirrors, Auto-dimming Rear-View mirror, Auto-leveling suspension, Automatic temperature control, Black Headliner, Bodyside moldings, Brake assist, Bumpers: body-color, CD player, Child-Seat-Sensing Airbag, Compass, Delay-off headlights, Driver door bin, Driver vanity mirror, Dual front impact airbags, Dual front side impact airbags, DVD-Audio, Electronic Stability Control, Emergency communication system: Mercedes me connect, Eucalyptus Wood Trim, Exterior Parking Camera Rear, Four wheel independent suspension, Front anti-roll bar, Front Bucket Seats, Front Center Armrest w/Storage, Front dual zone A/C, Front reading lights, Fully automatic headlights, Garage door transmitter: Homelink, Genuine wood console insert, Genuine wood dashboard insert, Genuine wood door panel insert, harman/kardon® Logic 7® Surround Sound System, Heated & Cooled Front Cup Holders, Heated door mirrors, Heated Front Seats, Heated front seats, Heated Steering Wheel, Illuminated entry, Illuminated Star, Knee airbag, Leather steering wheel, Low tire pressure warning, MB-Tex Upholstery, Memory seat, Occupant sensing airbag, Outside temperature display, Overhead airbag, Overhead console, Panic alarm, Panorama Roof, Passenger door bin, Passenger vanity mirror, Power adjustable front head restraints, Power door mirrors, Power driver seat, Power Front Seats w/Driver Memory, Power Liftgate, Power moonroof, Power passenger seat, Power steering, Power windows, Premium audio system: COMAND, Rain sensing wipers, Rear anti-roll bar, Rear fog lights, Rear reading lights, Rear seat center armrest, Rear Seat Entertainment System Pre-Wiring, Rear window defroster, Rear window wiper, Remote keyless entry, Roof rack: rails only, Security system, Single CD Player, Speed control, Speed-sensing steering, Speed-Sensitive Wipers, Split folding rear seat, Spoiler, Steering wheel memory, Steering wheel mounted audio controls, Tachometer, Telescoping steering wheel, Tilt steering wheel, Traction control, Trailer Hitch, Trip computer, Turn signal indicator mirrors, Variably intermittent wipers, Weather band radio, and Wheel Locking Bolts Vehicle may not have all options as described due to automated process. With Available Options Like Appearance Package (20" 10-Spoke Wheels and Illuminated Running Boards), Driver Assistance Package (Active Blind Spot Assist, Active Brake Assist w/Cross-Traffic Function, Active Lane Keeping Assist, Distance Pilot DISTRONIC & Steering Pilot, DISTRONIC PLUS w/Steering Assist, PRE-SAFE PLUS, and Traffic Sign Assist), Driver Assistance Package Plus, Lighting Package (Active LED Headlamps and Adaptive Highbeam Assist), Parking Assist Package (PARKTRONIC w/Active Parking Assist and Surround View System), Parking Package, Premium 1 Package (Android Auto, Apple CarPlay, DVD Drive, KEYLESS GO®, Multi-Color Ambient Lighting, Navigation Updates for 3 Years, Power Passenger Seat w/Memory & Lumbar, Radio: COMAND Navigation, SiriusXM Satellite Radio, and Smartphone Integration Package - Apply CarPlay, Android Auto), 19" 5-Spoke Wheels, 2nd Row Power EASY-ENTRY, 3.27 Axle Ratio, 3rd row seats: split-bench, 4-Way Driver Lumbar Support, 4-Wheel Disc Brakes, 8 Speakers, 8" Color Display Upgrade, 8-Way Power Front Seats, ABS brakes, Air Conditioning, AM/FM radio, AM/FM/CD Radio, Anti-whiplash front head restraints, Auto tilt-away steering wheel, Auto-dimming door mirrors, Auto-dimming Rear-View mirror, Auto-leveling suspension, Automatic temperature control, Bodyside moldings, Brake assist, Bumpers: body-color, CD player, Child-Seat-Sensing Airbag, Compass, Delay-off headlights, Driver door bin, Driver vanity mirror, Dual front impact airbags, Dual front side impact airbags, DVD-Audio, Electronic Stability Control, Emergency communication system: Mercedes me connect, Eucalyptus Wood Trim, Exterior Parking Camera Rear, Four wheel independent suspension, Front anti-roll bar, Front Bucket Seats, Front Center Armrest w/Storage, Front dual zone A/C, Front reading lights, Fully automatic headlights, Garage door transmitter: Homelink, Genuine wood console insert, Genuine wood dashboard insert, Genuine wood door panel insert, harman/kardon® Logic 7® Surround Sound System, Heated & Cooled Front Cup Holders, Heated door mirrors, Heated Front Seats, Heated front seats, Heated Steering Wheel, Illuminated entry, Knee airbag, Leather steering wheel, Low tire pressure warning, MB-Tex Upholstery, Memory seat, Occupant sensing airbag, Outside temperature display, Overhead airbag, Overhead console, Panic alarm, Panorama Roof, Passenger door bin, Passenger vanity mirror, Porcelain Headliner, Power adjustable front head restraints, Power door mirrors, Power driver seat, Power Front Seats w/Driver Memory, Power Liftgate, Power moonroof, Power passenger seat, Power steering, Power windows, Premium audio system: COMAND, Rain sensing wipers, Rear anti-roll bar, Rear fog lights, Rear reading lights, Rear seat center armrest, Rear window defroster, Rear window wiper, Remote keyless entry, Roof rack: rails only, Security system, Single CD Player, Speed control, Speed-sensing steering, Speed-Sensitive Wipers, Split folding rear seat, Spoiler, Steering wheel memory, Steering wheel mounted audio controls, Tachometer, Telescoping steering wheel, Tilt steering wheel, Traction control, Trailer Hitch, Trip computer, Turn signal indicator mirrors, Variably intermittent wipers, Weather band radio, and Wheel Locking Bolts Vehicle may not have all options as described due to automated process. With Available Options Like Appearance Package (20" 10-Spoke Wheels and Illuminated Running Boards), Lane Tracking Package (Blind Spot Assist and Lane Keeping Assist), Lighting Package (Active LED Headlamps and Adaptive Highbeam Assist), Parking Assist Package (PARKTRONIC w/Active Parking Assist and Surround View System), Parking Package, Premium 1 Package (Android Auto, Apple CarPlay, DVD Drive, KEYLESS GO®, Multi-Color Ambient Lighting, Navigation Updates for 3 Years, Power Passenger Seat w/Memory & Lumbar, Radio: COMAND Navigation, SiriusXM Satellite Radio, and Smartphone Integration Package - Apply CarPlay, Android Auto), 19" 5-Spoke Wheels, 2nd Row Power EASY-ENTRY, 3.27 Axle Ratio, 3rd row seats: split-bench, 4-Way Driver Lumbar Support, 4-Wheel Disc Brakes, 8 Speakers, 8" Color Display Upgrade, 8-Way Power Front Seats, ABS brakes, Air Conditioning, AM/FM radio, AM/FM/CD Radio, Anti-whiplash front head restraints, Auto tilt-away steering wheel, Auto-dimming door mirrors, Auto-dimming Rear-View mirror, Auto-leveling suspension, Automatic temperature control, Bodyside moldings, Brake assist, Bumpers: body-color, Burl Walnut Wood Trim, CD player, Child-Seat-Sensing Airbag, Compass, Delay-off headlights, Driver door bin, Driver vanity mirror, Dual front impact airbags, Dual front side impact airbags, DVD-Audio, Electronic Stability Control, Emergency communication system: Mercedes me connect, Eucalyptus Wood Trim, Exterior Parking Camera Rear, Four wheel independent suspension, Front anti-roll bar, Front Bucket Seats, Front Center Armrest w/Storage, Front dual zone A/C, Front reading lights, Fully automatic headlights, Garage door transmitter: Homelink, Genuine wood console insert, Genuine wood dashboard insert, Genuine wood door panel insert, harman/kardon® Logic 7® Surround Sound System, Heated door mirrors, Heated Front Seats, Heated front seats, Heated Steering Wheel, Illuminated entry, Knee airbag, Leather steering wheel, Low tire pressure warning, MB-Tex Upholstery, Memory seat, Occupant sensing airbag, Outside temperature display, Overhead airbag, Overhead console, Panic alarm, Panorama Roof, Passenger door bin, Passenger vanity mirror, Porcelain Headliner, Power adjustable front head restraints, Power door mirrors, Power driver seat, Power Front Seats w/Driver Memory, Power Liftgate, Power moonroof, Power passenger seat, Power steering, Power windows, Premium audio system: COMAND, Rain sensing wipers, Rear anti-roll bar, Rear fog lights, Rear reading lights, Rear seat center armrest, Rear window defroster, Rear window wiper, Remote keyless entry, Roof rack: rails only, Security system, Single CD Player, Speed control, Speed-sensing steering, Speed-Sensitive Wipers, Split folding rear seat, Spoiler, Steering wheel memory, Steering wheel mounted audio controls, Tachometer, Telescoping steering wheel, Tilt steering wheel, Traction control, Trailer Hitch, Trip computer, Turn signal indicator mirrors, Variably intermittent wipers, and Weather band radio Vehicle may not have all options as described due to automated process. 2018 Mercedes-Benz GLS GLS 550 4MATIC® 4MATIC® 4.7L V8 BiTurbo 9-Speed Automatic Blue Metallic Sunroof / Panorama Roof, NAVIGATION!, 3rd Row Seat, Backup Camera, Bluetooth, Hands-Free, AWD / 4WD, Heated Seats, Keyless Entry, Leather Seats, Multi-zone Climate Control, Premium Wheels, Premium Sound, Premium Package, BLIND SPOT ASSIST, KEYLESS-GO. With Available Options Like designo Espresso Brown Leather Package (designo Espresso Brown/Black Exclusive Nappa Lthr and Porcelain DINAMICA Headliner), Driver Assistance Package (Active Blind Spot Assist, Active Lane Keeping Assist, BAS PLUS w/Cross-Traffic Assist, DISTRONIC PLUS w/Steering Assist, PRESAFE PLUS, and Speed Limit Assist), Night Package (Wheels: 21" AMG Twin 5-Spoke 2-Tone), 14 Speakers, 3.27 Axle Ratio, 3rd row seats: split-bench, 4-Way Driver Lumbar Support, 4-Wheel Disc Brakes, 8" Color Display Upgrade, 8-Way Power Front Seats, ABS brakes, Air Conditioning, AM/FM radio: SiriusXM, AM/FM/CD Radio, Anti-whiplash front head restraints, Auto High-beam Headlights, Auto tilt-away steering wheel, Auto-dimming door mirrors, Auto-dimming Rear-View mirror, Auto-leveling suspension, Automatic temperature control, Blind spot sensor: Blind Spot Assist warning, Bodyside moldings, Brake assist, Bumpers: body-color, Burl Walnut Wood Trim, CD player, Child-Seat-Sensing Airbag, Compass, Delay-off headlights, Door auto-latch, Driver door bin, Driver vanity mirror, Dual front impact airbags, Dual front side impact airbags, DVD-Audio, Electronic Stability Control, Emergency communication system: mbrace2, Exterior Parking Camera Rear, Four wheel independent suspension, Front anti-roll bar, Front Bucket Seats, Front Center Armrest w/Storage, Front dual zone A/C, Front reading lights, Fully automatic headlights, Garage door transmitter: Homelink, Genuine wood console insert, Genuine wood dashboard insert, Genuine wood door panel insert, harman/kardon® Speakers, Heated & Cooled Cup Holders, Heated 2nd Row Seats w/Rear Climate Control Panel, Heated door mirrors, Heated Front Seats, Heated front seats, Heated Steering Wheel, Illuminated entry, Illuminated running boards, Knee airbag, Leather steering wheel, Leather Upholstery, Low tire pressure warning, MAGIC VISION CONTROL, Manual 2nd Row Sunshades, Memory seat, Navigation system: COMAND, Occupant sensing airbag, Outside temperature display, Overhead airbag, Overhead console, Panic alarm, Panorama Sunroof, Passenger door bin, Passenger vanity mirror, Power adjustable front head restraints, Power door mirrors, Power driver seat, Power EASY ENTRY, Power Front Seats w/Driver Memory, Power Liftgate, Power moonroof, Power passenger seat, Power steering, Power windows, Premium audio system: COMAND, Rain sensing wipers, Rear air conditioning, Rear anti-roll bar, Rear fog lights, Rear reading lights, Rear seat center armrest, Rear Seat Entertainment Pre-Wiring, Rear window defroster, Rear window wiper, Remote keyless entry, Roof rack: rails only, Security system, Single CD Player, Speed control, Speed-sensing steering, Speed-Sensitive Wipers, Split folding rear seat, Spoiler, Steering wheel memory, Steering wheel mounted audio controls, Tachometer, Telescoping steering wheel, Tilt steering wheel, Traction control, Trailer Hitch, Trip computer, Turn signal indicator mirrors, Variably intermittent wipers, Ventilated front seats, Weather band radio, Wheel Locking Bolts, and Wheels: 21" 5-Spoke Light Alloy Vehicle may not have all options as described due to automated process.